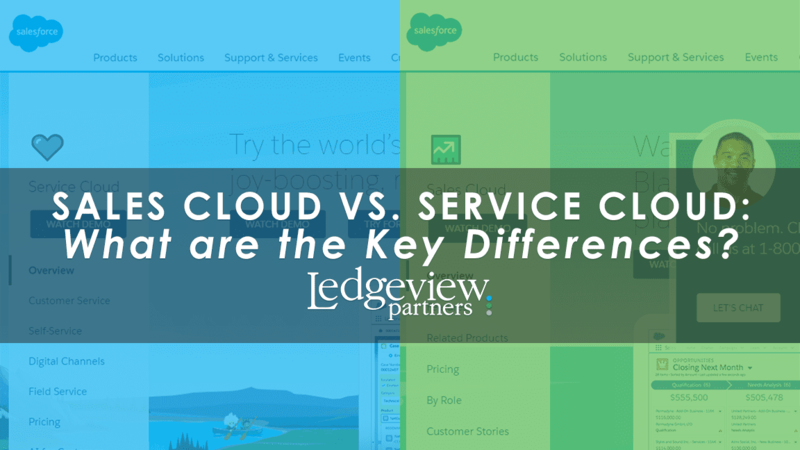 Sales Cloud vs. Service Cloud: What are the Key Differences? When you sign up for Salesforce, you are given two module options: Sales Cloud and Service Cloud. With Service Cloud, users are typically more focused on service and cases. Service Cloud helps companies that sell services and/or products, whereas Sales Cloud is more helpful for companies who are focused on leads, opportunities, and sales. However, there is a ton of overlap between Sales Cloud and Service Cloud. Both modules have opportunities and cases, for example. The points we mention in this blog post focus on the specific strong suits each module has for specific roles and organizations, highlighting key differences. Keep in mind, there is A LOT more information to learn about both, and we encourage you to browse this blog for more information on each platform. Keep in mind, the aforementioned Add-Ons for each module require additional licensing. Add-Ons help to create a more comprehensive system to streamline service-based businesses, get services in front of target audiences, connect with like-minded professionals, and be used to better serve your customers. Service Cloud is built on the Salesforce Customer Success Platform. It provides you with a 360-degree view of your customers and enables you to deliver smarter, faster, and more personalized services. With Service Cloud, you can automate service processes, streamline workflows, and surface key articles, topics, and experts to transform the agent experience. Sales Cloud offers Web-to-lead functionality, whereas Service Cloud offers Web-to-case functionality. Salesforce Service Cloud makes connecting one-to-one with every customer, across multiple channels on any device, extremely easy. In 2018, Service Cloud provides users the ability to deliver instantaneous and personalized support via the phone, email, chat, and now, even an SMS messaging app system of their choosing through LiveMessage. Users can gage a deeper understanding of their customers by using Service Cloud. Additionally, Salesforce managers benefit from Salesforce Service Cloud by having access to a complete view of team performance with dashboards and recommendations to include pre-built customer service dashboard, available for install on the AppExchange, and Live Agent Supervisor to provide a real-time look at your customer service team. Service Cloud works to boost the efficiency of an organization and increase customer satisfaction by providing easy access to self-help capabilities, and by streamlining all customer service interactions. Finally, you can reduce case volume with a self-service portal through Service Cloud that allows Users the opportunity to be a part of a custom, branded community, which connects them to like-minded Users to share knowledge on important Salesforce Service Cloud subject matter. When it comes to choosing between Sales Cloud and Service Cloud, you must acknowledge the general difference is that each cloud system was made to support a specific set of features that you use to sell your products or services and support them. Learn more about how to leverage Sales or Service Cloud for your organization today. Reach out to Ledgeview Partners to get started with your Salesforce journey to success.